Another unfortunate gap in this blog is now over. This one is due to my summer travels. 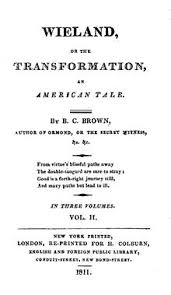 Now, I am back in Taiwan and ready to write, beginning with the first American gothic novel: Wieland by Charles Brockden Brown. 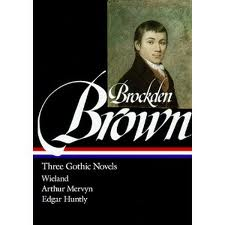 Brown was not only the first American gothic writer, he was the first professional novelist of the young American republic. A little context on this may be useful. Wieland is narrated by Clara Wieland and follows her life on a farm with her brother Theodore. Theodore Wieland married Catherine Pleyel. They maintain a close friendship with Catherine’s brother Henry. They live a quiet life of filled with conversation and intellectual fulfillment. Again, expressing a American sentiment, the Wielands are not wealth estates holders. They have a humble background, complicated by their father’s oddities and bizarre death. He was a follower of a strange religion, which he attempted to deliver to the Indians. He died suddenly of spontaneous combustion. This left the Wielands as orphans. When Theodore is given the chance of claiming an inheritance in Europe he refuses, choosing the more simple life. So, unlike in much of British gothic writing, we are not looking at the elite. 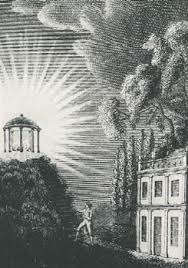 However, in sentiment, custom, and morality the narrator Clara reveals a level of humble virtue that was so much a part of the early American ideal. Their life is disrupted by the arrival of Carwin. He is physically mysterious and the details of his past are only revealed in fragments. Clara comes to know that he is wanted in Europe for robbery, but escaped to America. She is—it seems—attracted to Carwin despite the threat he poses to her virtue. Clara often claimed she felt he was a risk to her life as well, but the subtext is much more sexualized it seems to me. With his arrival Clara—and more importantly Theodore—start to hear voices. Many of these are produced by Carwin who has the ability to throw his voice, a skill he mastered and uses for his own benefit. Pleyel, who is preparing to marry Clara, overhears a conversation suggesting Clara had a sexual relationship with Carwin. Pleyel leaves after confronting her on this. Clara denies having this conversation. It was created by Carwin, who had his own designs on Clara. Later, Theodore killed Catherine and his children, claiming that he was ordered to by voices he has heard. Clara immediately blames Carwin for creating these voices. Carwin confronts Clara, confessing his malevolent uses of his ability, but denies ordering Theodore to kill anyone. Carwin saves Clara’s life from Theodore who escaped from jail. At the end, Clara leaves America for Europe, following Pleyel. What I am trying to suggest is that the major theme of Wieland is separation and the division between the Old World and the New. Brown is uncertain quite where that takes him or what to do with it. Unlike a more vulgar work like The Contrast, which places American virtue and European hypocrisy in stark terms. In Brown’s Wieland the divisions are confused, chaotic, and traumatic. This makes it a more realistic tale.